Summer is here and free music is on the docket! 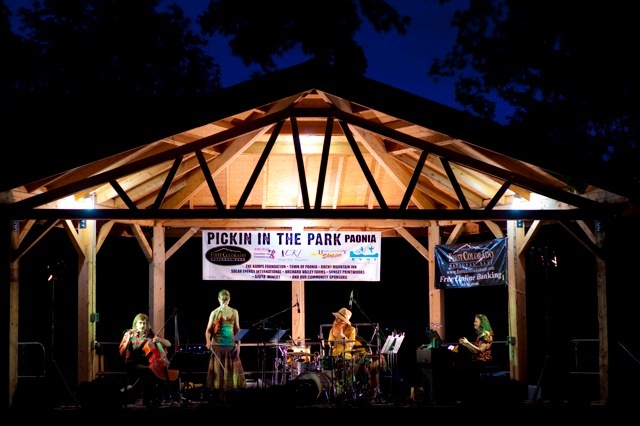 Pickin’ Productions showcases an out of this world concert series returning to the town parks in Ridgway and Paonia each Thursday this July and August with choice national and international bands that will surely inspire toe tappin’, skirt twirlin’ and hip shakin’! 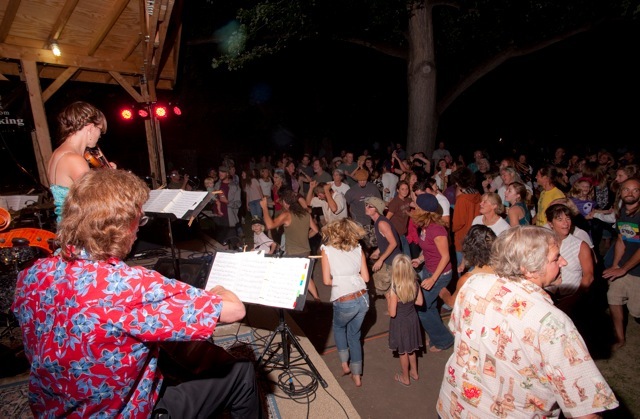 Even if you cannot attend Pickin’ in the Park in person, the North Fork Valley’s community radio station, KVNF, broadcasts every show on air, and streams them on the internet. All you need to do is turn your dial to KVNF or point your browser to KVNF.org. Another perk to lure you down to the Ridgway and Paonia parks is the variety of local food and drink. Enjoy a refreshing cider from Big B’s or a hoppy IPA from Revolution Brewing. Local wines are also available. They taste great paired with BBQ style treats from Delicious Orchards and decadent ice cream from Cowabunga for dessert. Kicking off the month of July in Ridgway the first Thursday (July 2), is the funky, dance provoking Sol Driven Train along with Ragtime-esque band, Blair Crimmins and the Hookers. Thursday, July 9 check out Nashville quintet, Humming House. They will blow you away with their beautiful harmony. Humming House will headline for opening band, Intuit who plays a diverse array of musical genres, pleasing all types of musical preferences. July 16 will be headlined by rock and roll band, The Congress who will follow the sweet sound of The Blackberry Bushes. To mix it up even more, Mipso, an Appalachian influenced group will start the set on July 23 opening for the soulful Roxy Roca. And lastly, the Ridgway Concert Series will end with a string pluckin’ night on July 30 from Front Country and The Steep Canyon Rangers. One month down, another month to go! 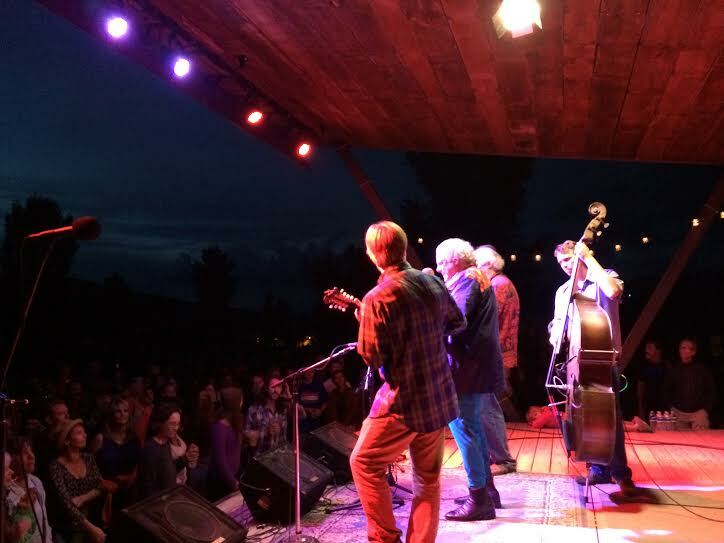 Pickin’ in the Park in Paonia launches on August 6 with a killer lineup. To add even more fire to this summer’s series, each opening band will play at Paonia’s Paradise Theatre after the headliner is finished for the Paradise After Dark Series. The Paradise Theatre is another fantastic venue equipped with a dance floor and full bar! A small $5 cover at the door will keep the music rollin’! The first acts of Paonia’s Pickin in the Park series are world traveling folk duo, Handmade Moments and 8 piece Latin dance music band, Todo Mundo. Todo Mundo came to Paonia earlier this year and blew everyone away with their groovy world beats. Next up on August 13 is the funky band, Jelly Bread followed by Nathaniel Rateliff and the Night Sweats. The Night Sweats are the second 8 piece band to play in Paonia this summer, but two isn’t enough. Dustbowl Revival is yet another 8 piece band that will continue to light up the dance floor on August 26 along with the jazzy Davina and the Vagabonds. To round out the amazing summer concert series, come see Colorado grown band, The Railsplitters and Grammy nominated bluegrass band, Frank Solivan and Dirty Kitchen. The Pickin’ Production series is definitely a town favorite among people of all walks of life and ages. Join your fellow community members in a beautiful, family friendly environment for some fantastic music.